I wanted to create a salad combination that I’ve never had before, so I looked around see what would pair well with plums. I chose pistachio and dill and it turned out to be a winning combination. For this raw food recipe, all you will need is a high-powered blender. 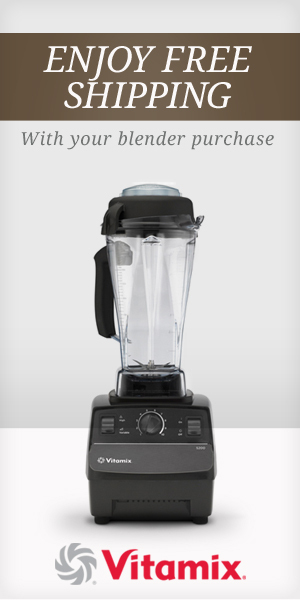 I personally use and love my Vitamix. I’ve had mine for many years now it was one of the best investments I’ve ever made for my kitchen. It’s one of the top 4 healthy kitchen essentials I use and recommend stocking your kitchen with. Blend on high. Then add the dill and pulse in for a few seconds. Here’s a good aesthetic trick to keep in mind when you’re making a dressing that requires fresh herbs. If you were to add the dill right into the dressing and blend it all together, you’d get a brownish looking dressing (red + green = brown). Instead, you want to blend all the other ingredients first, then do a rough chop on the dill and just add it in for a few seconds until you have an even speckle of green in your purplish/reddish dressing. It’s important to make food look appealing because our eyes play a major role in terms of how much you like what you’re eating! Another thing to keep in mind is that how much water you use will determine how thick or liquid your dressing will be. You could add a 1/4 cup of water instead and make this more of a dip, or add the full cup and make it a more liquid dressing. If you like thicker dressings, start with 1/2 cup of water and work your way up from there! I love to keep my recipes simple, and try to keep my meals to only a few ingredients. One of my favorite ways to do this is to make a salad dressing with certain ingredients and then also top the salad with those same ingredients. So for example, I made a plum, pistachio and dill salad dressing and then topped the salad with slices of plum and whole (shelled) pistachios as well with just a hint of dill. I used spinach as the base and found this to be a perfect taste for the plum pistachio dressing. Since I’ve created this salad recipe, I’ve made it for myself 3 times this week! If you want to learn how to make raw foods, come and join us for a private raw food retreat right here on the Big Island of Hawaii! Have fun playing with this new recipe! Let me know how you like it!